Soldiers killed in today's Hezbollah attack identified as Maj. Yohai Kalangel and Sgt. Dor Nini. 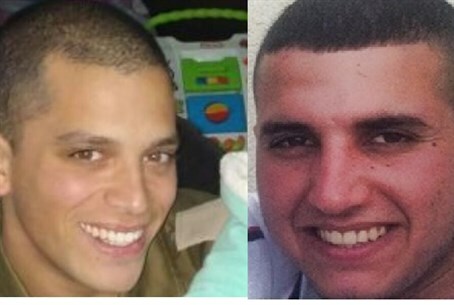 The two soldiers killed in Wednesday's antitank missile attack on the IDF are Major Yochai Kalangel and Sgt. Dor Nini, the IDF Spokesperson's Office has announced. Kalangel, 25, an Elazar native who lived in Har Gilo with his wife Tali and one year-old daughter, was a commander of the Tzabar unit of the Givati Brigade. Kalangel was promoted to Major after his death; he was previously a Captain. He received an award for excellence last year before Israeli Independence Day from then-President Shimon Peres. Nini, 20, from Shtulim, was a fighter in the same unit. He was promoted to Sgt. from Corporal after his death. He leaves behind two older brothers, his parents, and his girlfriend Rotem; Nini will be buried at 4:30 pm Thursday in his hometown. Hezbollah terrorists attacked an IDF post along the border earlier Wednesday, firing no fewer than six anti-tank missiles at soldiers. The onslaught wounded seven other soldiers, and killed a Spanish UN peacekeeper in Lebanon.